Ah Way of the Samurai, a love or hate game that achieved cult status on the PlayStation 2 with a good deal of positive reception. Ever since the first however, it seems the series has never gotten that reputation back. The second and third games were met with mixed results, even scorn from die hard fans. After the third game’s production wrapped up, Acquire promised that the new installment would be an improvement in every way possible to not only to its predecessor, but to the entire franchise. Way of the Samurai 4 is the next installment of the sandbox series that puts you in the role of the nameless samurai which you create, wandering into a town, and eventually getting involved into an escalated fight, sticking his/her nose where it doesn’t belong to help out for better or worse. The “Way” of the Samurai is indeed a harsh and strict path of life. The year is 1855, and our nameless hero’s destination is the fictional port city of “Amihama”, the hot bed of an upcoming revolution for Japan, as the Shogunate has opened its borders to foreigners. As you arrive, your character already gets caught in the middle of a fight that has been escalating for some time now between Government Forces under the Shogunate, Foreigners of the British Navy, and the Anti-Foreign Power or “Disciples of Prajna”. You can choose to side with any of the three factions, all the while meeting a vast array of characters: from a princess to an eccentric count, a women clad in golden armor to a magistrate who is a walking cliche of a supposed “honorable” samurai and a hot headed rebel with a childhood friend who has the “ask questions later” sort of mentality. Then we have the sinister 3 sisters, and what they call pleasure is not what you would say is “normal”; their methods of dealing with criminals is downright bizarre. The apple doesn’t fall far from the tree when it comes to their father who is the chief minister, the quote on quote “Villain” of the game who’s believes the answer to everything is pain, suffering…. and boiling. So you’re probably asking yourself, is this a serious story? The answer is a simple no. 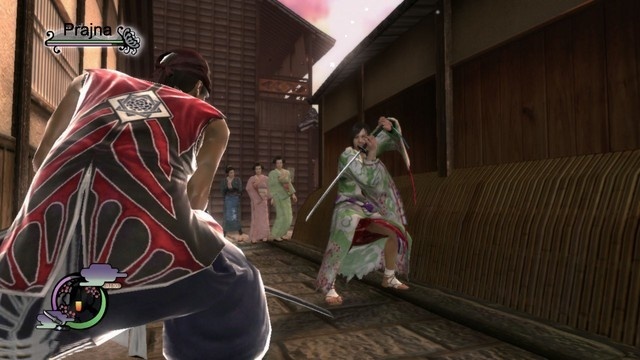 While it has its fair share of sad, morbid, and serious moments, Way of the Samurai 4 goes even further into ridiculous territories then any of the previous installments. The series has always had a quirky side, but is taken to extreme lengths with this one. My advice is take the game as seriously as the game takes itself, which it hardly does. While that may sound awful from the way I’m describing it, I actually like what the mood of the series has become recently, as story isn’t Acquire’s forte unlike Sega when it comes to the Yakuza series where the story is the main draw. We have instead what is a funny tale that includes a mishmash of zany characters in a world that is not what you would expect in a video game, which is not only unique, but in a setting that works. Speaking of story, progression is now shown in the convenience of a journal that shows all of the events and story paths connected to the factions you have or haven’t done; a huge improvement for the series as before you had to memorize what story path you had taken in your play through. The third entry had 22 endings plus a bonus one; this time it was scaled down to 10 in what at first glance may come off as lazy but is actually an improvement, since most of the endings in the third game had little to no distinctions from each other and it then became a mundane chore of trying to unlock them all. So lessening the fat, Acquire made the choice to go for more quality over quantity this time around, as some endings from the same path also have radically different outcomes, giving us satisfying endings with the dedicated work in getting them all. As stated before, your character gets thrust into combat at the very beginning, but unlike the past games you are given a tutorial which was greatly needed as many complained that they weren’t even told how the controls worked, let alone how combat worked. The game also comes packaged with a virtual manual at the start menu so you can review the basics if need be, which is a nice bonus. Though simple to grasp, the combat system gets even richer with the new additions. While standard combat hasn’t really changed since the first game, you can still kill or beat enemies non lethally with the blunt side of your weapon, there are few improvements. Health and Vitality have been split into two. Vitality is used with any action from simply kicking to attacking to even using the fast travel ability on the map screen. It also determines if you and your enemy regenerate your health. It took some getting used to as quick travel was a simple, yet brilliant design choice by Acquire, so having something to deter you from using it too often did, to the say the least, bum me out. Even worse is the fact that normal enemies can also regenerate their health; it gets really frustrating when an enemy decides to back off then and quickly get all their health back, basically making your effort for naught. This added much needed tension for bosses that were before just another battle, but for normal enemies it causes nothing but head aches. A good effort by the developers, but it just doesn’t work well with this kind of game. The old “Heat” system has been removed entirely for a new “durability points” system in which weapon durability drops gradually with usage weather be it from attacking or defending. You will need to have on-hand items for a quick fix or a smithy to patch up your weapons for a fair price. Another huge change for the franchise is that weapons no longer have the skills embedded into them, but instead you now have move sets you acquire by defeated foes or by unlocking them with “Samurai Points”. Which is by all means a welcome change, as you can now use a long sword, mid sized swords or a even knife sized weapon with a move set that would have before been used exclusively for short sized swords. Heck if don’t like what you see, make your own skill set with the endless possibilities at your disposal. Additionally the previous game’s “Glimpse of Death” combat feature has been replaced with the “Spring Harvest” feature. Instead of instantly killing your foes with on que button presses, you now have the ability to slow down time and repeatedly slash the enemies surrounding you, killing them all with great swiftness, then cap it off by sheathing your sword to have them all fall before you at the same time. As I said before the game is a sandbox type game, it has 11 different maps/areas with sub areas and shops. Each area is connected to one another by sections, so it’s not a fully open world game. The end result is a decent sized game with a enough nooks, crannies and hidden items scattered about waiting to be found. One of the new mechanics that Acquire was hyping up for the game is the “Proof of Life” mechanic. How it works is that actions done in one play through will carry over or affect the next one. For example, killing too many innocent civilians will have dire consequences in the next play through, as more guards will be out on patrol, making it harder to pull off crimes. Another example you will notice is that if you can’t talk to most of the foreign civilian NPCs that you will eventually run into, there will be an event that will unlock a language school which once open will allow you to speak with them. Be warned though, as story events like these can be overturned by another story event which will nullify the reward such as the school. While it certainly isn’t everything they promised, the mechanic does work and subtle changes can be felt which is a welcome new addition to the franchise. My hope is that they improve what they accomplished and make an even bigger and grander set of consequences for future entries. Two new, special features caught me by surprise when the game was first announced, which I can say are the best features! *Ahem* Anyway, first up is the Torture Mini-games. Once arrested for doing naughty deeds, your samurai will be sent to the torture room, where the three beautiful Kinugawa sisters will… mingle with you and want to play some bizarre mini-games. The games include, being tide to wheel contraption while being dunked in water, a wooden horse that occsionally goes on fire while being tide to a high rope, and the last one you’re on a track and have to avoid slabs of rock being thrown at you. The second is the “Night Crawling”(Yobai) mini-game, which is stealth mini-game that requires you to first have a normal NPC (Or Special NPC) fall for you, who will then make an “appointment” with you. You must sneak around their house, trying avoid or knock out family members/guards while using the turtle indicator to find the right futon where she (or he) awaits thee. Ah torture-I mean Oh god how horrifying! The two features are downright silly that caught a little ire of a few folks at home, but fear not! They’re quite playful and don’t really imply anything more. At the end of the day, it’s all good clean fun. Next Post:More The World Ends With You Projects Teased?